If you want svelte, toned arms, cardio is not the answer. Because if you don’t have the muscle in the first place, there’s no way you can show it off. “You have to create the shape [first], and weight training is the simplest way to do that. That’s why we have created this upper body strength workout. 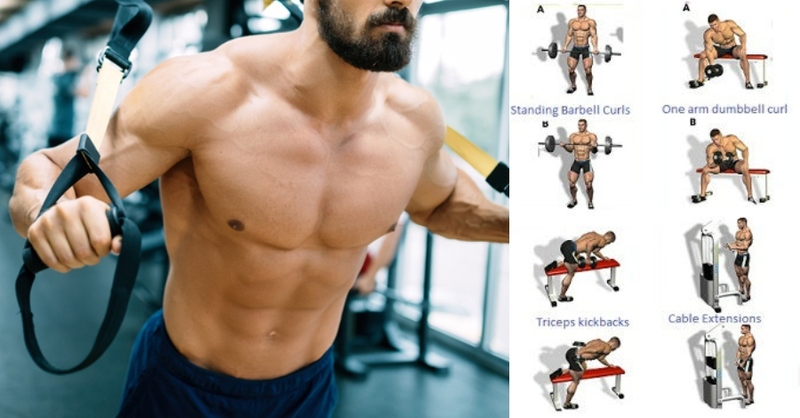 Not only will you feel like a total machine moving through these moves, but they also prove that you don’t need to wait for the bodybuilder next to you to be done using the dumbbells. Why: Doing your press-ups holding suspension training handles allows your muscles to move through a greater range of motion to hit your chest, triceps and shoulders harder. It also forces your abs and lower back to work more to stabilise your torso. Hold a handle in each hand with your body in a straight line from head to heels. The more upright you are, the easier the move is, so lower your chest towards the floor to make it harder. Make sure your back is straight before starting a set, whether you are standing up straight or starting in more of a traditional press-up position with your chest closer to the floor. Keep your chest up and core engaged, then bend your elbows to lower your chest. Pause in the bottom position for a second, then press back up powerfully to the start. 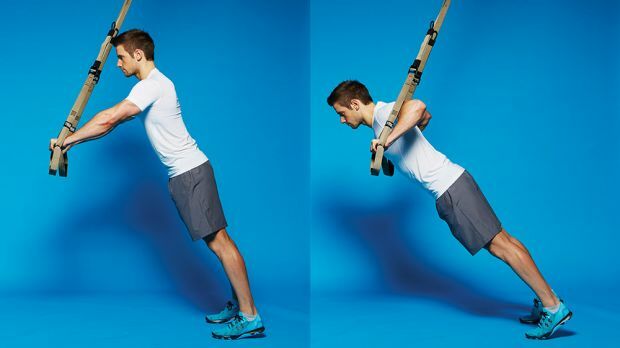 Tip: It’s essential to keep your core braced for the duration of the set because it will improve the stability of your torso and so minimise the risk of stressing your elbow or shoulder joints. Why: Working each arm independently is a smart way to achieve balanced gains and works each limb harder than when using both arms at the same time. This move has the added benefit of also working your abs because they must keep your torso upright, and you turn it into a full-body move by squatting down and up before pressing the weight. Position one end of a barbell in a landmine barbell holder, or the corner of a room. Load a weight plate on the other end. Squat down to lift the bar up, then stand up tall holding the end of the bar at shoulder height. Keep your chest up and abs engaged, then press the bar up until your arm is straight. Lower it again and repeat. 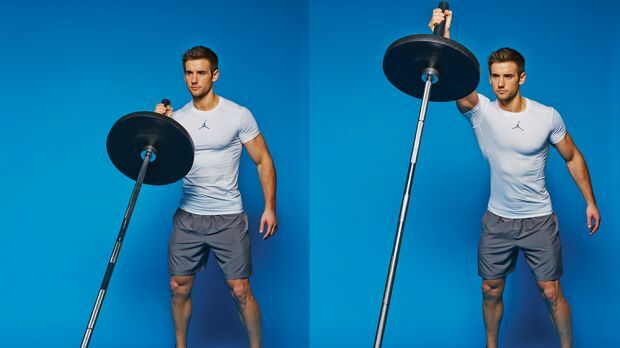 Do equal reps with both arms. Why: Doing eccentric weighted reps is one of the best ways to smash through a strength plateau, allowing you to do more reps and add muscular size across your entire back. They a because your muscles are stronger during the eccentric (lowering) part of each rep and by skipping the concentric (lifting)phase when you are weakest, you can fully fatigue your muscles safely. 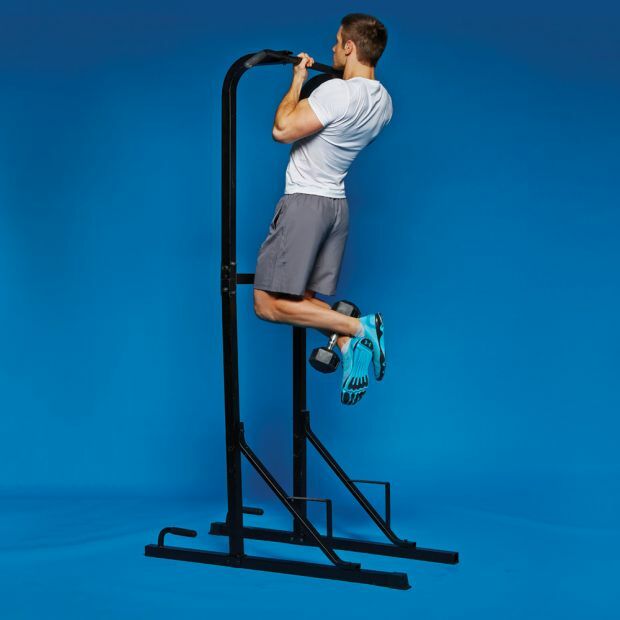 Do this move either after your last set of normal chin-ups or as a standalone set. Grip a dumbbell between your ankles, then jump to the top position and hold it for a second with your working muscles under tension. Slowly lower your body, ensuring your muscles are under tension throughout. Once your arms are straight, drop to the floor and then jump back to the top. Why: Many people struggle with more traditional rowing moves, such as the barbell bent-over row, because of poor mobility or flexibility. This option allows you to hit the target muscles effectively without compromising the health of your joints. Hold a handle in each hand with your body in a straight line from head to knees. You can make the move harder by keeping your legs straight. Keeping your chest up and abs engaged, row your torso up towards your hands. Pause and squeeze your back and biceps at the top, then slowly lower yourself until your arms are fully straight. Why: Not many moves allow you to work each side of your chest independently, but this one does. The added benefit is that your body is completely supported by the ground, which isn’t the case on a bench. Lie flat on the floor with your knees bent, holding a kettlebell by the handle in one hand. The weight of the ball should be resting against your forearm. Press the weight directly up until your arm is straight, then lower it back to the start. Once you’ve done all the reps, switch arms and complete the same number of reps.
Why: Press-ups are among the best bodyweight moves anyway, but adding a resistance band makes it more difficult to press back up, which means you works your chest, shoulders, triceps and abs harder. Start in the press-up position but with a resistance band running over the middle of your back and secured in both hands. Ensure your wrist, elbow and shoulder joints are aligned, your abs are engaged, and your body is in a straight line from head to heels. Bend your elbows to lower your chest, then press back up to the start.